Easter Island, also known as Isla du Pascua and Rapa Nui has one of the most isolated populations in the world. Originally settled somewhere between 700 and 1200 CE by Polynesian Islanders, this South Pacific island has become one of the most incredible living examples of effects of overpopulation in existence. There is so much more to this Chilean province than many people expect when they arrive. We take a spectacular Easter Island photo journey to bring you some of the most incredible locations on this island of mysteries. 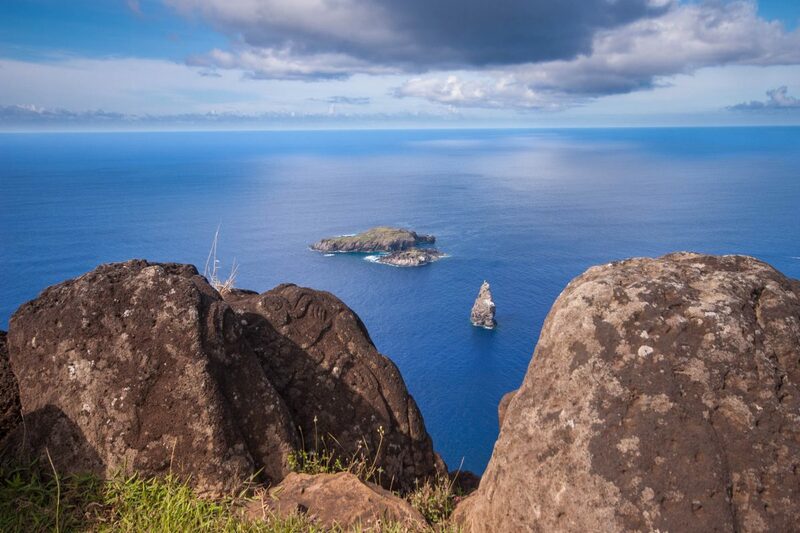 Getting to Easter Island can be an adventure on its own. Easter Island is one of the most remote islands in the world. It’s nearest inhabited neighbor is 1,289 miles ( 2,017 km) away! Hanga Roa is the capital and only city on Easter Island. This tiny city hosts the majority of the island’s population of 5,800 people. Around 60% of the island’s population are Rapanui. The town has a hip vibe with excellent restaurants, quaint lodgings, and refreshing cafes to help visitors settle into this isolated island. Just outside the town lies a replica of the famous Moai that demonstrates how they would have looked in their original condition, gazing inland, before they were toppled during clashes between island clans. The marina in Hanga Roa offers a glimpse of the local fishing lifestyle. The waters surrounding Easter Island are teeming with life, and the abundant fish population helps to sustain the island’s human inhabitants. Visitors to the island can be treated with incredible seafood platters at the local restaurants. As we continue our Easter Island photo journey, we visit the famous Rano Raraku, otherwise known as The Quarry. This is where the Rapanui created the incredible moai that would grace the shores. 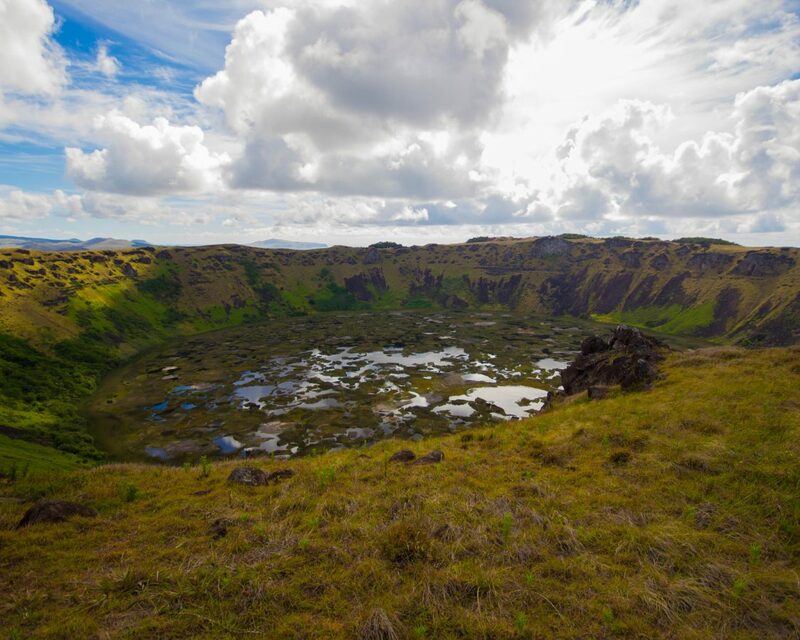 This volcanic crater on the far east of Rapa Nui contains the volcanic ash the locals carved to create 95% of the mystical monolithic sculptures that guard the island. 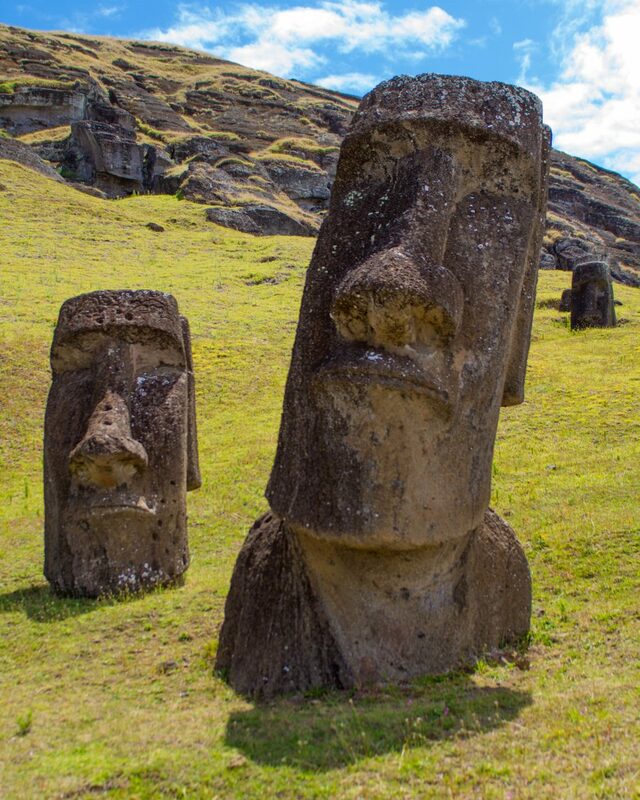 Over 397 moai remain on the outer slopes of Rano Raraku, many still partially buried by the shifting soils, while others lie broken in a reminder that even great sculptors have bad days. The view of these massive stone figures in various states of completion and disarray gives evidence to the massive amount of labour involved not only in sculpting these tremendous figures, which often consisted of not only the heads but shoulders, torsos and sometimes down to hips, but also of the work needed to bring these completed sculptures down from Rano Raraku to their final place of display on the shores of Easter Island. 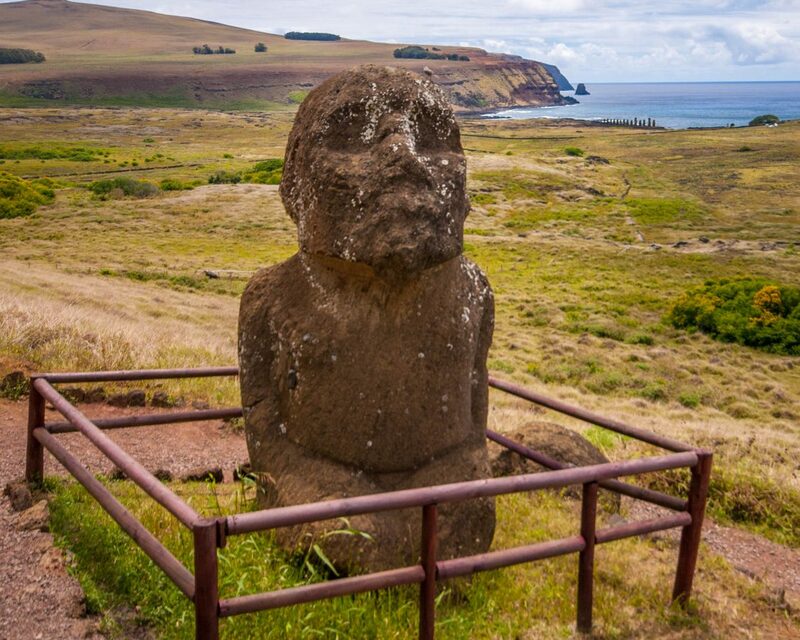 One of the most interesting moai found within Rano Raraku is Tukuturi. This moai is unique due to its bearded appearance, and the fact that it was placed inland and is sculpted to represent a kneeling figure. 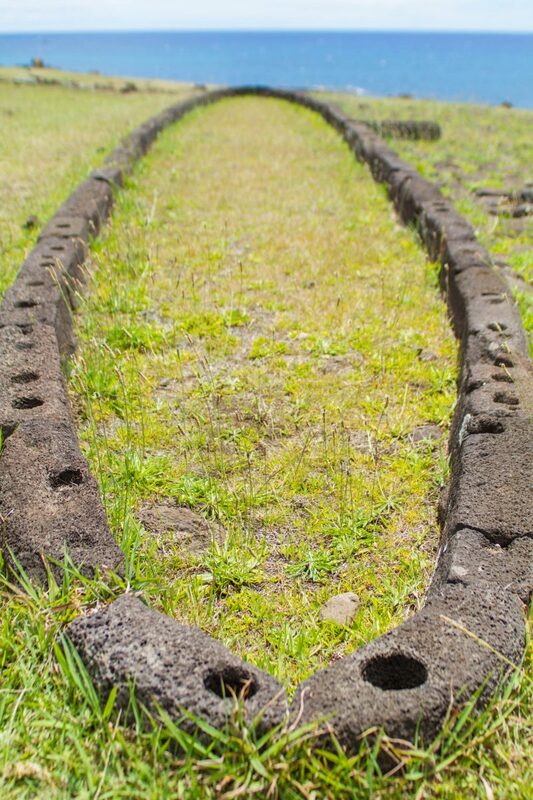 Ahu is the name given to stone platforms found throughout Easter Island. 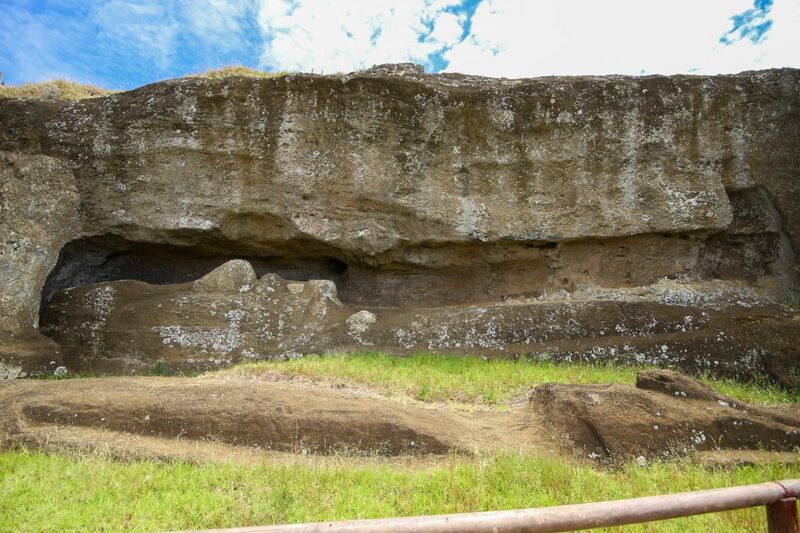 With 15 moai, Ahu Tongariki is the largest ahu found on the island. 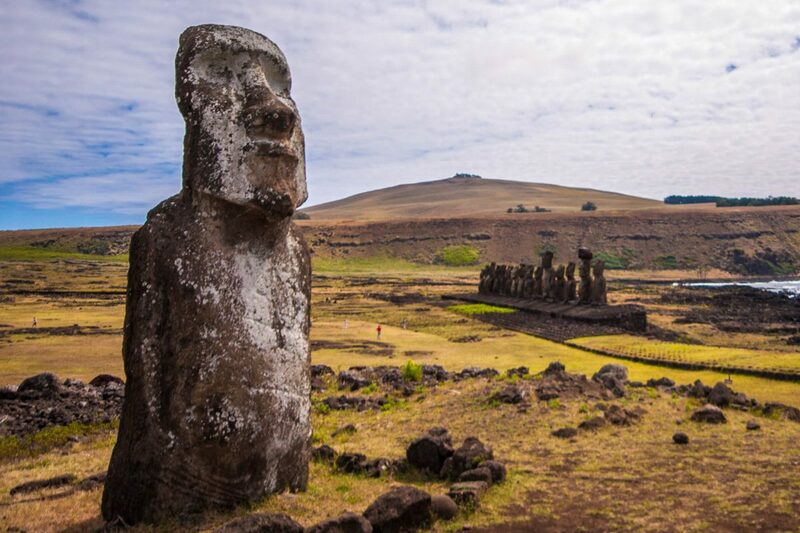 Like many of the moai on the island, those at Ahu Tongariki were knocked over during the island’s civil unrest before western explorers happened upon the island. 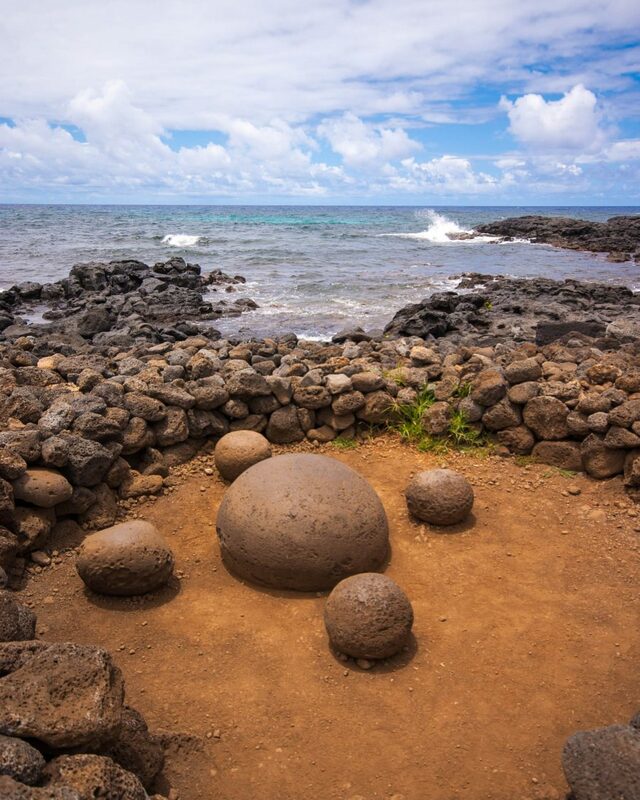 In the 1900’s, the ahu and sculptures were washed inland by a tsunami but have since been re-erected in their original place facing the sunset during the Summer Solstice. Nearby to Ahu Tongariki is the so-called “Travelling Moai”. This moai was given this name after wandering more than any other of the moai. It first made a trip from Rano Raraku to Japan where it was displayed at the World’s Fair and was used by western explorer Thor Heyerdahl, to determine how the locals moved the moai from place to place. Ahu Te Pito and Rano Raraku were the only two areas of the island which had moai still standing during the beginning of western influence on the island, but this location is not to be missed for another important and mystical reason. 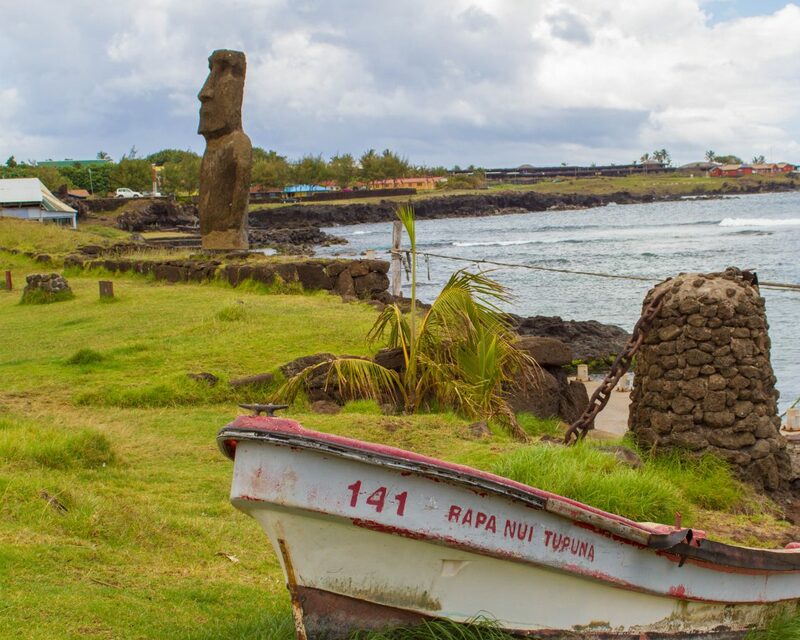 While the locals name for the island, Rapa Nui, is believed to translate to the “Naval of the World”, this area of the island is also commonly associated with the same phrase. It contains a very special rock that some claim lets off a magnetic force. Whether you feel it’s power or not, it’s a beautiful location and a great spot to stop and relax. One of the more unique items on our Easter Island photo journey is Ana Kai Tangata. 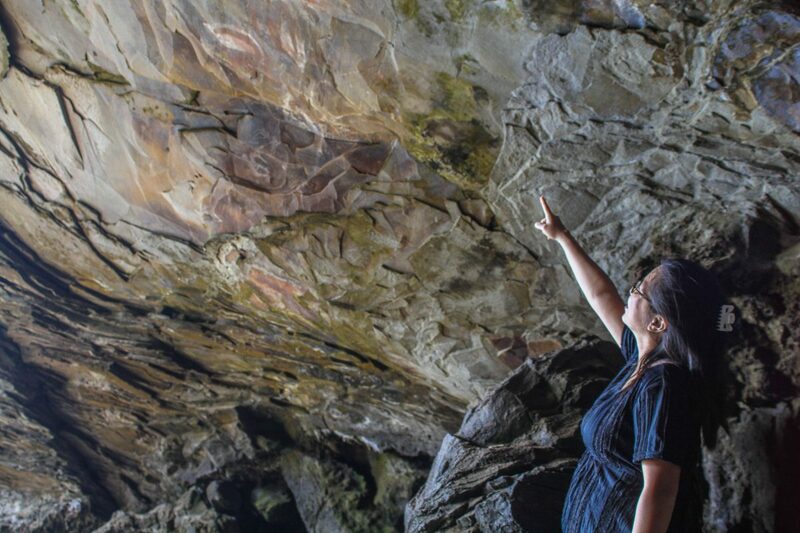 Ana Kai Tangata is a famous cave on Easter Island that is known locally as “The Painted Cave”. This cave is easily accessible from Hanga Roa and it is believed to have been an ancient meeting place, or place of teaching on the island. The cave features paintings of birds drawn using natural earth pigments and animal fat. Unfortunately, the environment of the cave has led to them being rendered very difficult to see, but they are worth a visit. Makemake is believed by the Rapanui to be the creator of humanity as well as the god of fertility. 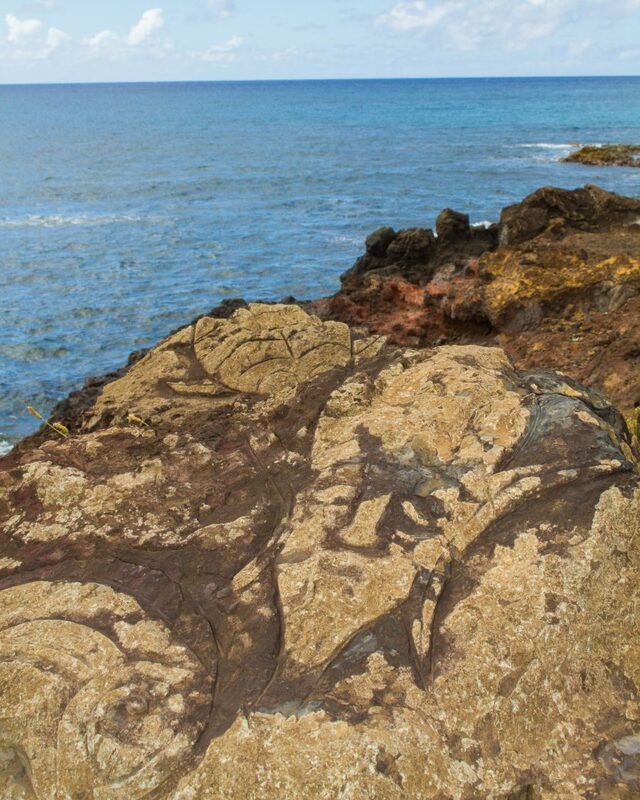 Several petroglyphs depicting this deity can be found throughout the island, including areas just outside of Hanga Roa. Makemake was also the chief god of the bird-man cult and was believed to be in the form of sea-birds. Makemake can be seen in petroglyphs in the form of a man with a bird’s head. Orongo, on the southwestern tip of Easter Island, contains the remnants of a stone village which was the centre of much of the key ceremonies during the islands later years prior to western occupation. It has several low, grass-covered buildings with rounded walls situated near the tip of the Rano Kau volcanic crater. Rano Kau is one of the most colourful areas of the island. The base of the 300-metre walls of the crater is a gorgeous marsh. The marsh is one of the islands only three bodies of fresh water. Rona Kau and Orongo were also central to the fascinating Tangata manu, or Bird-Man competitions that the islanders used during the later years to determine leadership. The Bird-Man was the winner of an annual competition whereupon they chose the greatest warrior from each tribe. This Tribesman would set out from Orongo to swim across through the shark-infested ocean waters to the islet of Motu Nui. Once there, they would collect the first egg of the season of the sooty tern and then swim back to Rapa Nui. They would then have to climb the Rano Kau sea cliff and return the egg, undamaged to Orongo. The Tangata manu would be celebrated and given gifts while his clan would have sole rights to that years egg-harvest. Our Easter Island photo journey concludes at Rona Kau, high above the waters of the South Pacific. We only touched the essentials of visiting Easter Island, there are more ahu and moai scattered throughout the island that are worth visiting. The island offers so much to see beyond the moai as well. 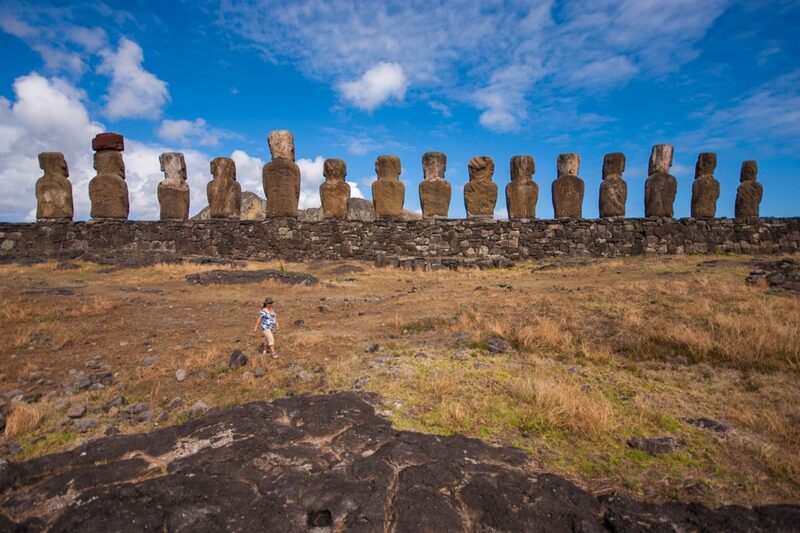 Is Easter Island on your bucket list? I’ve always wanted to go to Easter Island. I almost went a couple of years ago, but the flights were too expensive. Thanks for sharing your photos though, it’s almost makes me feel like I was there. Happy to share! It’s an incredibly special place and I really hope you get the chance to visit! Easter Island has always been fascinating to me. I hope there’s an opportunity for me to go someday. Your blog post pointed out so many different things to see there…including some I wasn’t aware of. Your photos are beautiful, and your post very informative! Easter Island comes up as a place with so many untold stories etched in stone. The massive stone figures are intriguing and all your photos are stunning. I think I twisted my tongues many times reading the names hahaha.. Eastern Island was not on my radar, I just learned about it now, because of you. And now thanks to you I’ve found another interesting place to check out. It looks so amazing, look at all those statues made me real curious. I’d sure love to see them up close. Great article, this is next on my list to travel ,I cant wait ! Thanks for sharing! I would totally love to head to easter island! I love the massive stone figures. Each of the stone figures seems to be telling you a story. Wow very interesting! I really do want to visit Easter Island someday. I didn’t know about the cool restaurants, so that makes it even more interesting to check out! Ancient civilization & good food? Sign me up. This was a great article to read, I’ve always wanted to visit Easter island and I will get there one day. The pictures are up there with some of the best I’ve seen of the carvings, it makes me want to hop on a plane and head there straight away. Awesome! I hope you let us know how the trip goes! Awesome pictures and great post. 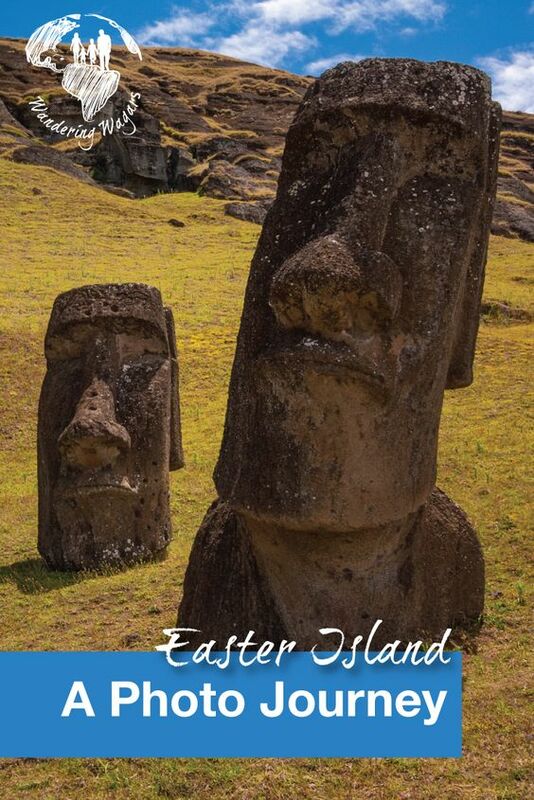 Easter Island is definitely on my list… actually, i might be able to swing that way later this year! Absolutely interesting article and great photos! Thank you very much for sharing this. I love volcanic craters, history and sculptures- I’d love to go! Any tips on making it more affordable- I’ve heard it is very expensive to get there. Breathtaking….now I have another spot to add to my bucket list. This is definitely on my bucket list, it’s one of the islands I have wanted to visit since I was a kid. It’s really incredible, even if you’re seeing it from pictures. I can only imagine how lovely it must be when you’re actually there. I love the history behind it too. Interesting! Easter Island is not what I imagined. Thanks for sharing! Will definitely add this to bucketlist! So many things I didn’t know of Easter Island that I learned from this post! I have always thought that it’s a remote place and you can only see the statues there. Didn’t realize that a town is nearby. This is one place I’ve always wanted to go! It’s so cool to see what the statues would have looked like in one of your first pictures. The eyes are a bit jarring! When I first learned about Easter Island as a teenager, I thought it was the most interesting place I’ve ever heard of. I never heard about the caves there and really enjoyed all of your photos. They are beautiful. Without a doubt it is a fascinating place with such a unique and incredible history. It’s really good to see there’s more to Easter Island than just the statues! We’re considering it for next year and weren’t sure if it would be worth the effort and expense but I’m thinking it is looking at this! Your photography is really amazing. I always love visiting your website! Wow you always have some great photos but I love this article. Interesting to know a little bit more about the culture/history side of things. Great photos! Really capturing its beauty. Sounds like such an interesting place. I love to visit this place soon!!! ? I would love to visit Easter Island. The photos are great and really capture its intrigue. Made the trip to Easter Island with Intrepid 4 years ago. I’d love to return one day – it was such a fascinating place! Your article brought back so many memories. It’s a long trip from North America so we added on Peru with Intrepid too. It looks so good that it doesn’t even look real! Great pix! I love when I can learn about the history of a place as I stare in awe at the photos. I can only imagine what it would have been like in person. Awesome photos you have taken there! To be honest, it has never been on my to-go list, but I also thought it is a British territory. I have also seen these weirdly looking heads and I loved the last story about swimming in the ocean with sharks and bringing the egg back. Amazing legend! I love love LOVE this! Easter Island is on my bucket list and I really hope to go there one day soon. I haven’t really heard much or Easter Island or thought about going but this post makes me want to! I’ve always wanted to go to Easter Island. Great details and photos! So much of this I have no clue about! Would really love to get out to Easter Island if I return to Chile someday! Stunning photos! I hope to visit Easter Island someday. Maybe I could add it on to a trip to Chile. I’ve been reading a lot about Easter Island recently! Makes me want to make a visit. Your photos are stunning! Great post! I have read a few now about Easter Island but yours had photos of areas that I had not seen before. It is so interesting! Thanks for sharing :). Easter Island is definitely on my must-visit list! Thanks for this wonderfully illustrated post – makes me want to get there sooner than later. Easter Island is certainly on our bucket list. It’s such a fascinating place with unique history. Lovely photos as well btw. I also found Rano Raraku really interesting, especially of the figure kneeling. I couldn’t tell about the beard, am I missing something? Wow Hanga Roa only has 5,800 people? I’m from NYC and am used to a city of 9,000,000! Looks wonderful. I’m sure your pictures don’t do it justice. So cool to be somewhere quite secluded. This brought back such wonderful memories from our own trip! Easter Island is one of the only destinations which I found to live up to it’s hype. Many places over time have been hyped up and I’ve arrived disappointed – but not here. Every bit as magical as the photos and as everyone says! Love, love, love your photos and this post! I’ve been dying to visit Easter Island for awhile and I almost went when I was traveling through Chile a few years ago, but unfortunately never made it. Your post reminded me that it’s definitely a must-see destination! I’ve always wanted to go to Easter Island! Such a beautiful and fascinating place 🙂 great photos! I never thought to put it on my list, but now I think I should. The information you put in here is so interesting, and the sculptures are fascinating. Would love to see this in person! Lucky you guys, great photos! Easter Island is the first thing i want to see when buy a plane ticket for South America. 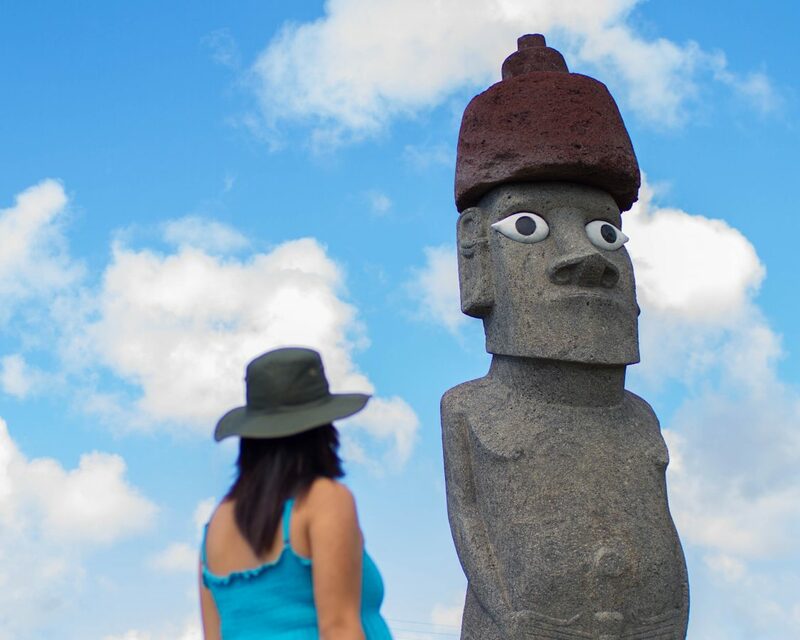 Way to capture and share moai shots that are more than the standard views. I love how they’re placed kind of everywhere, as well as other rock forms. The moai statues have always fascinated me! Does moai Tukuturi mean anything in English? It’s interesting that it has a beard and was placed inland and sculpted kneeling. Easter Island is absolutely on my bucket list, though the journey is quite long and expensive. Still, your photos just reinforce my desire to go. And I had no idea how large the moai are until I saw them here. Not only does Easter Island seem magical, but it seems like the powerful natural beauty and mystical qualities of the place would stay with you long after the trip is over. Easter Island is definitely a place I would like to go one day, but it’s not yet a priority. I’m trying to knock out all of the “traditional” spots first, with particular focus on Asia. The “Naval of the World” looks really interesting! There is so much more to Easter Island than the heads, and I love it. I’d absolutely love to travel there. I have longed to travel to Easter Island since I read about it in the 4th grade! Hopefully, I will make it there soon. Wonderful photos. Absolutely fascinating. I just can’t imagine I will ever get here, but it sounds like such a worthwhile experience. I love all the sculptures you saw – and it’s so interesting to find out that there’s so much more to do and see here too. I’ve long been fascinated with Easter Island and came close to making it there last month. Your pictures make me want to go even more now! Easter island is on my bucket list! I think it would be interesting to see and explore the island. Are there other things to do around the island apart from the archaeological side/seeing the animals? Can you go swimming or do they have any adventure sports as well? Looks like a fascinating place. The colors in that marsh area immediately said, “Come visit.” Your photos have me diving into learning more about Easter Island. Interesting to read about, and see photos of, the rest of Easter Island – as normally people only share photos of Ahu Tongaraki. So thank you for that. The rest of the island looks spectacular indeed. Yes, Easter Island is definitely on my bucket list. I loved your post and feel like I know so much more about it now and exactly what it offers. Your photography is spectacular. I never would have guessed the town would be so hip! Beautiful photos (as always!) and what a fabulous trip! Easter Island is somewhere I have always wanted to go but I’ve always been put off by its remoteness – which translates as expensive – to reach it. I’m determined to get there someday tho – thanks for the inspiration! What a fantastic write up. Definitely on my bucket list. What a truly magical place, I would absolutely love to visit here! I really enjoyed the expressions that the maoi seem to have, particularly those two that are half-sunken into the soil. Great photos too. This place looks magical in so many ways, both mystical and wondrous to see. There’s obvious so much more to this place than just the statues most of us associate with it. I learned a bit more about the caves and petroglyphs. Thank you. Haha while reading this in my head, I definitely tripped over a lot of the names, but wow – incredible photos! I’ve always been intrigued by Easter Island, and would love to go someday (although getting there is quite pricey). I just remember when I was a lot younger, scrolling through country lists out of boredom and seeing the name, thinking “this exists???”. I’ve seen the big stone statues in museums before but going to the island itself must be something else. Someday, I hope! Easter Island has always been on my “eventually” list, even though I didn’t quite know what was there. Thank you for taking us on a photo journey around the island and giving excellent information on what there is to see. Your photos are stunning! I hope you make it! It’s an amazing and unique place, but definitely not easy to get to. Ahhh, I love this place! It brings so much memories from my trip especially I was really hung over when I got there! Your photos are fantastic. Thanks for sharing! Easter Island is wonderful and historical. 🙂 I would love to go here someday, and your post convinced me that I should. You’re so lucky to be able to explore the island. I’ve read in an esoteric book that the statues in Eater Island were big because a set of early humans was also giants. I think that’s interesting. That’s a really cool myth Kat, one that I hadn’t heard yet! On my bucket list! The sculptures are absolutely fascinating in the pictures, they must be even better when you stand in front of them! For long I have been fascinated by these Moai . Thanks for such an informative and detailed post on these. I dont know when I can head here but I sure would like to see them myself.